Rows of colorful tulips as far as the eye can see, a light breeze running through your hair, the earthy smell of dirt, and the taste of delicious kettle corn symbolize the beloved experience at Skagit Valley Tulip Festival. This is event is geared towards visitors of all ages but if you happen to be traveling with a tot, here are some tips from a local mom on how best to prepare for and execute your adventure. The drive is easy freeway driving for approx. 90 minutes each way (from Seattle Southside). For lightest traffic plan on arriving at the fields early in the day on the weekends or travel during non-rush hours mid-week. Stop at the Tulip Festival Administration office 311 W. Kincaid St. Mount Vernon, WA 98273 for free maps, advice on where to start/stop your excursion and special event info. With maps and “Tulip Route” signage the fields are easy to find. Wear practical shoes. There aren’t sidewalks in the fields; be prepared for dusty to muddy conditions. My daughter wore her pink polka dot rain boots for fashion and the practicality purposes. Walking paths are made out of firmly packed gravel or dirt. Check weather forecasts to get an idea on stroller friendly conditions. 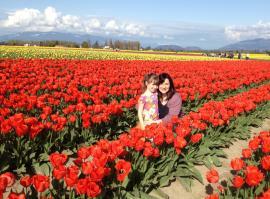 There are multiple tulip farms to see and each is immense. For families with young children I recommend pacing yourself and expect to visit one farm maybe two. We spent two hours at one field, had dinner then drove back. It was a long five hour outing for a four year old but days later she’s still talking about the “bee-you-tee-ful flowers” and I’m still admiring a collection of charming photos. The RoozenGaarde field has food vendors. (fair food cuisine and prices) There’s a grassy area with a few tables and room to have a picnic. Bring cash. Some vendors accept cash and plastic – others take cash only. There are plenty of facilities (porta-potties) at the farms. For families with babies or young toddlers, bring a blanket in the diaper bag because I didn’t see any changing areas. No pets allowed in the tulip fields. Leave Fluffy or Fido at home. *Bonus tip – make sure your camera has plenty of battery life you’ll have a “bazillion” photo opportunities. How to get there? Take exits 221-231 off of Interstate 5. Or buy a ticket from Shutter Tours (206)504-2128 or take a group there via a charter bus by Starline Coaches. When to visit?The flowers bloom according to their own schedule, which can be as early as March 25 and as late as April 30. Be sure to call ahead to check the conditions of the fields if you’re on the early or late side of the bloom cycle. Fields are viewable from sunrise to sunset. How much does this cost? Depends on how many fields you want to see. We spent our time at RoozenGaarde. Parking and my daughter’s admission was free. My admission was only $5. More information at the Tulip Festival&apos;s website. Call us at Seattle Southside for more information, or stop by and see us. We’ll print out a free customized map for you and we’d love to hear about your adventure. Be sure to leave us a comment for the blog or post on our Facebook page.